Colwood has new retaining wall regulations that require a permit for the construction of retaining walls over 1.2 metres (4 feet). In 2015 the City of Colwood began a review of how retaining walls are constructed in the City. This was in response to concerns about the impact of retaining walls on the natural landscape in Colwood. Previously, all retaining wall designs in Colwood required sign-off by a Geotechnical Engineer before being approved for construction. New retaining wall standards and permit requirements are intended to provide clear direction for developers and builders, encourage construction that maintains the integrity of the natural topography, and consider impacts to surrounding neighbourhoods. During February 2016, the City discussed proposed changes with the Council of the Victoria Residential Builders Association and hosted a public open house to gather input into new regulations for retaining walls. The new regulations require a permit for retaining walls over 1.2 metres (4 feet) and that when a wall is terraced, it must have a 1:1 ratio of height to horizontal separation (sections must be at least as far apart as they are high). 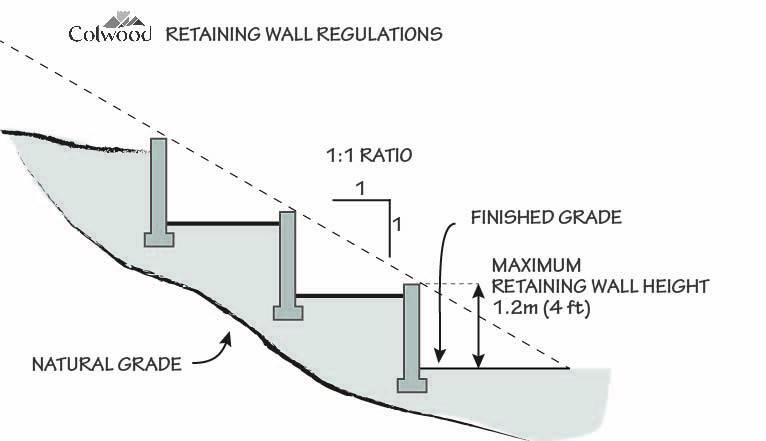 Read the amended Building Bylaw regarding Retaining Wall Regulations. When does the bylaw take effect? The building bylaw takes effect immediately. It was adopted by Council on Wednesday, May 11, 2016. No building permit will be required when retaining walls meet the regulations. Applicants can ask to vary the regulations by applying for a development variance permit. This will allow Council to review variance applications and give the public an opportunity to provide input. Currently the application fee for a variance permit is $1,500 and the turnaround time is approximately 2-3 months from application to issuance. Where a Development Variance Permit has been issued, a Building Permit will be required in order to construct the wall. Retaining walls subject to a building permit will require engineered drawings signed off by a Professional Engineer and/or a Geotechnical Engineer. What is considered a retaining wall? A retaining wall is a structure that is constructed to hold back, stabilize, or support the land behind it. They vary in size, configuration and material. Most often they are built using rock or concrete. Natural grade refers to the elevation of the ground surface prior to any disturbance, alteration, excavation or filling takes place. A topographical survey is used to document the grade prior to land alteration.